These elegant, finely crafted, solid-wood storage chests come in 2-door and 4-door options with maple drawer fronts and maple veneer and are finished in a rich honey maple stain. Recessed door pulls give these cabinets a more streamlined appearance and makes for an easier fit into a variety of AMSEC safes. All drawers are elegantly lined in a silky, dark red felt with heavy-duty, ball-bearing drawer glides and include a variety of Stor-It Jewelry Organizer Inserts. Each insert can be removed for easy viewing, selecting and protection of your jewelry. 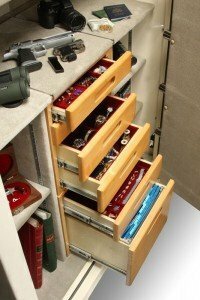 Top drawer includes a Three Compartment Ring Organizer and a Seven Compartment Jewelry Organizer. 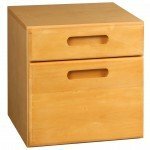 Bottom drawer can be used for bulky items or converts to a file drawer. Top drawer features a three compartment ring organizer and a seven compartment jewelry organizer. Drawer two features a three compartment necklace organizer. Drawer three features a four compartment watch organizer. 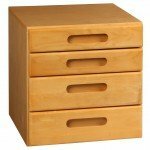 Drawer four can be used for bulky items, or add more Stor-it Jewelry Organizers. *No kit needed. Drawers slide right in.